The fourth book in the fantasy Ascension series that NYT bestselling author Susan Dennard called "perfect for fans of Sarah J Maas." War is on the horizon. All while a new power grows strong, threatening the very balance of good and evil. Desperate to save her homeland, Cyrene goes in search of the dragons that may be the key to ending this battle—and heal her dying friend. Can Cyrene master her magic to save the world? DRAGONS! And the amazing Cyrene. But Dragons!!!! This book is everything! Everything. Book 4. Oh how I've longed for book 4. Perhaps one of the best things about this series is getting to revisit the characters I've been separated from for so long. A year between books allows me to go back to the beginning over and over again each year to refresh on the characters I love. But this one was worth the wait. We get questions answered, leave with even more questions, and of course, DRAGONS! I love every book K.A Linde writes, but my goodness something about this book just had me even more immersed in it than all the others. Perhaps seeing dragons in the last season of GOT made this book even more fascinating.  We get more magic, more journeys into the unknown, and get to finally see dragons. While following my favorite characters through this journey I have been all over the place on who to trust, who is an enemy and who Cyrene can truly trust. Kyla knows just how to mix enough angst into each book that you never know what to expect out of it and she surprises me around ever corner. I cant wait to find out what happens in the last book and see how our friends all survive. This is the 4th book in the Ascension series and takes off right where we left in "The Consort".. Cyrene has got to cross the seas to save her friend Avoca from coma and bring Dragons back to Emporia.. When it seems impossible to travel across sea to Alandria, with the help of Orden, Cyrene and her friends travel to Alandria for their mission.. However, getting help to reach Alandria seems to be the easiest part of their mission.. Cyrene needs to compete in a tournament in order to win over a dragon. And Ahlvie has to strike a hard bargain with healers to cure Avoca.. While Cyrene and her friends are engaged in winning over dragons, its getting worst in Emporia with Kael Dremylon gaining strength with blood magic.. And when i thought the real challenge was Cyrene going to war against the all powerful Kael, the author just changed the course of the whole story with a twist.. Nothing prepared me for the twist in the last two chapters of the book.. When everything was going in a direction for 63 chapters, the author just decided to throw us in hell with the last two chapters. However, the whole twist brought clarity to the prologues of the first three books!! This book is a massive 600 plus pages and the author's writing kept me glued till the end.. I loved Kinkadia and the new characters introduced in this book.. I love K.A. Linde writing..And this series is by far my favorite by the author and I so wish she writes more fantasy books in a year... 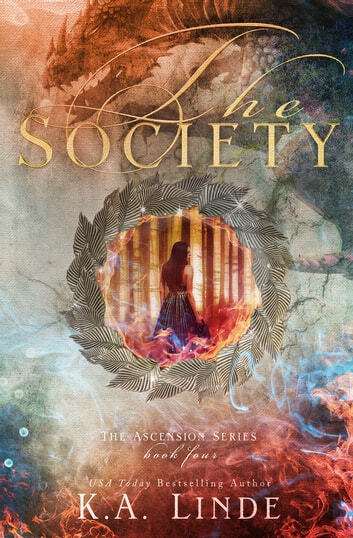 I cant wait for the final book of the series!!! wHY DOES SHE DO THIS TO US??? SHE LOVES TO TORTURE US!!! NOW, TO WAIT ANOTHER YEAR FOR THE NEXT BOOK....omg! Linde gave us another amazing chapter in the life of Cyrene! She found what she was searching for and learned new things about herself and the others helping the fight. But, what she learns at the end....OMG!!!! Again, Linde!!!! Y'all really want to read this series!! So, I will be the first to admit that I am not usually a fantasy reader. However, I had the awesome opportunity to start reading this series, and I love K.A. Linde, so I thought I'd give it a try. I am so happy I was able to, this series has blown me out of the water. I gobbled up the first three, and The Society was no different. It picks up right after The Consort left off, and yes, you must read these in order. The Society finds Cyrene and her friends in search of the dragons, however, no one has seen a dragon in many years. Along the way, they find adventure, danger, and more allies and adversaries. The stunning conclusion makes you thirsty for more. I loved the world that Ms. Linde has created, it's both dark and light, good and evil, and the characters come to life. The magic is all encompassing, and I can't wait for the conclusion!